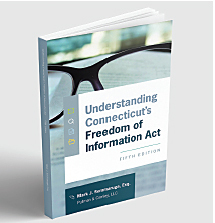 The Connecticut Freedom of Information Act (FOIA) was enacted in 1975. Often called the "Sunshine Law," the FOIA essentially has two components: 1) a requirement that the meetings of public agencies be held in the open, and 2) a requirement that the records of public agencies be subject to disclosure and inspection be the public at large. However, the FOIA also sets forth numerous exceptions to its open meetings and records requirements. This book should serve to provide guidance to public agencies seeking to navigate the maze of edicts and exceptions associated with the FOIA. This book is not intended to be substitute for contacting your agency's attorney when a particularly sticky situation occurs.